Before we dreamed of driverless cars, we dreamed of horseless horses. For most of human history, horses have been, primarily, a technology. An intimate technology, yes -- people named their horses, and groomed them, and sometimes loved them -- but horses were, for the most part, tools: They helped humanity to get around and get things done. Once steam power and internal combustion came along, though, that relationship changed drastically. As horses were eclipsed by more efficient methods of moving people and things -- trains, cars, planes -- their role in human culture shifted, as well. We quickly came to see horses more as what they had been, of course, all along: fellow animals. That shift is evident in a longstanding dream that is a little bit fanciful, a little bit practical, a little bit silly, and a little bit wonderful: the quest for the mechanical horse. While some creations -- the Scammel mechanical horse, the Iron Horse -- imagined themselves as horses' mechanized successors while not actually resembling them, many others have engaged in biomimicry of a more specific variety. While they are only one species we humans have seen fit to imitate with our machines -- the world now hosts, among other automatons, the mechanical dog, the mechanical dinosaur, the mechanical pack mule, the mechanical elephant, the mechanical flea, and the mechanical shark -- horses have held a special place in human hearts. Below, a brief history of the mechanical horse, from the 19th century to today. The inventor William Brunton took an engineer's eye to something humans had known for centuries: that horses were particularly well-suited to speedily delivering cargo over varied terrain. He took that realization to his steam horse locomotive, which featured leg-like levers meant to steady the vehicle as it was propelled by a combination of a boiler and piston. "The invention excited much attention," the Catskill Archive notes. "It had the merit of acting as the designer intended it should, and one day that it was on trial, rushing along at a speed of three miles an hour, accompanied by a host of admirers, the boiler exploded, throwing hot water, pieces of iron, and disaster among the crowd. That ended the career of the Mechanical Traveller." In January 1867, William Goodwin of Washington, D.C. filed for a patent for his mechanical horse under the category of "Automaton Toys and Hobby Horses." His invention, he argued, "consists in a novel method of applying mechanical movements to automaton toys made in the image of various animals whereby the toy is caused to move the legs head and tail in the act of walking and trotting after the manner of the animal which the toy is made to imitate." The illustration below, date unclear, captures the impulse of biomimicry at its most absurd. There is nothing equine in the operational logic of the steam-powered vehicle; a horse is replicated here for the sake of familiarity (and, one has to assume, just a bit of comedy). In 1893, Rygg filed for a patent for a mechanical horse that would work much like Goodwin's, but which was meant to be ridden. "The object of the invention is to provide a mechanical horse of convenient size for a person to ride on and of such construction that the rider may operate the horse with his feet causing it to walk guiding it &c."
By the 20th century, as cars came to eclipse their four-legged counterparts, mechanical horses began to take on a certain cheekiness. 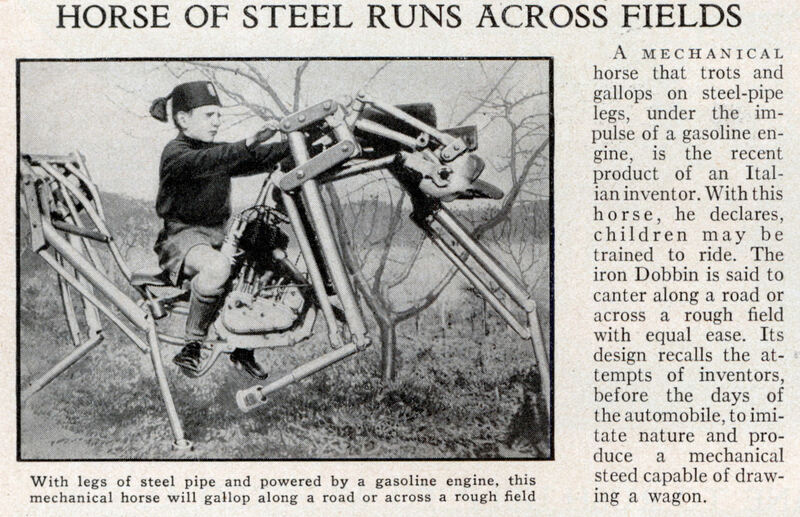 An article in Popular Science described the many capabilities of a newly invented "horse of steel" like so: "A mechanical horse that trots and gallops on steel-pipe legs, under the impulse of a gasoline engine, is the recent product of an Italian inventor. With this horse, he declares, children may be trained to ride. The iron Dobbin is said to canter along a road or across a rough field with equal ease. Its design recalls the attempts of inventors, before the days of the automobile, to imitate nature and produce a mechanical steed capable of drawing a wagon." While cars grew in commercial appeal, horses were still widely used for military purposes. Thus, the spring-mounted rocking horse -- not technically mechanical, but relying on the same premises -- that helped train cavalry officers. This mechanical horse, built by "Man of the Monsters" George Harold Messmore in the mid-20th century, attempted to mimic the motions of a race horse as it gallops. It is currently on display at San Francisco's Musee Mecanique. "Blowtorch" was the first fully mechanical horse. The creation of the Canadian inventor W.K. McIntyre, Blowtorch was engine-driven, with a body made from sheet metal that concealed a nine-horsepower combustion engine. Blowtorch had wheels instead of "hooves," which enabled the vehicle to move backwards and forwards. He was also painted black and white -- the markings of a real horse -- as well as a mane and tail. He is now stabled, the blog Eventing Nation notes, at Canada's Western Development Museum. And the cheekiness continued. To promote the claim that its motors put out more horsepower than its competitors, a manufacturer constructed a horse made entirely of motors (except, that is, for its mane). Enthusiastic lady not included. The "Walking Truck" was a four-legged transport device that was operated by a technician located inside the body on the vehicle. It was capable of climbing a stack of railroad ties, then kicking each tie off the pile. The Walking Truck was also sensitive enough to nudge a lightbulb without breaking it. I'd rather not include a picture of this. If you'd care to look, you can see one here and here. The Handspring Puppet Company created the larger-than-life puppet below for the movie War Horse. While technically not a "mechanical" horse -- it is powered, in a delightful twist, by people -- it is very much in the tradition of the mechanical horse. And also, kind of poetically gorgeous. Dismounted soldiers can sometimes carry more than 100 pounds of gear, resulting in physical strain, fatigue, and degraded performance. To help them out, DARPA is developing a highly mobile, semi-autonomous four-legged robot, the Legged Squad Support System (LS3). The technology is decidedly horse-like -- meaning that the Army of the future could involve a mechanized reinvention of the cavalry.